0 Republicans [0 last time]. Second row: David Schulz, Maria Vullo, Rowan Wilson. Before going further, let's be clear. This is not only another diverse list, but another strong one as well. Yes, this is the 2nd list from the Judith Kaye led Commission on Judicial Nominations that is very diverse and very strong. Not surprisingly, and by all accounts, the credit goes largely to the extraordinary efforts of the former Chief Judge. A great deal of outreach. A large pool of applicants. (As opposed to some embarrassingly small pools in past years before Kaye's leadership.) Applicants from the bench, from private practice, from government service. A list that reflects the wide and deep universe of legal talent in New York. A list that gives the Governor several very fine choices. Yes. Both times.The previous list to replace Judge Carmen Ciparick. And this one to fill Judge Theodore Jones' seat. So, especially for those who have been highly critical in past years--which critics certainly include me--it should be acknowledged when the lists are strong and the selection process is working much better than before. So New Yorkers should be grateful to Chief Judge Kaye and her Commission. Now, on to the individuals on the current list. Let's begin with the 3 African-Americans. As I've noted in the last post--and as anyone willing to be candid will agree--the Governor is very likely to choose an African-American. Judge Jones was the Court's only African-American. 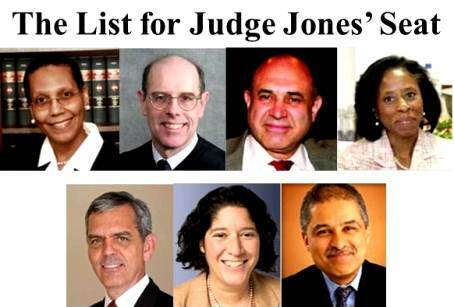 With his death, New York's highest Court is an all-White institution. The Governor almost certainly will not want to leave it that way. That makes Sheila Abdus-Salaam, Dianne Renwick, and Rowan Wilson the front runners. An appellate judge, another appellate judge, and a private litigator. They all have records to examine. Judicial records for 2 of them. A career in private practice for the other. And those records show that each of these 3 has much to commend. They each have qualities and experience that would be quite appealing to a nominating Governor. And for Democratic Governor Andrew Cuomo--whose previous nomination of Jenny Rivera, as well as his remarks about her, strongly suggest a preference for someone who's philosophically liberal--any one of them would seem to fit the bill quite well. Cuomo must make his choice within 30 days of receiving the list--that falls on a Saturday, April 6. Within the next 30 days, the Senate Judiciary Committee must conduct hearings and the full Senate must vote on confirmation. So by May 6, a new Judge will have been appointed to the Court of Appeals. Well before then, we'll look at the 7 individuals on the list. In the next post, we'll look at each of the 3 African-Americans--Abdus-Salaam, Renwick, and Wilson.